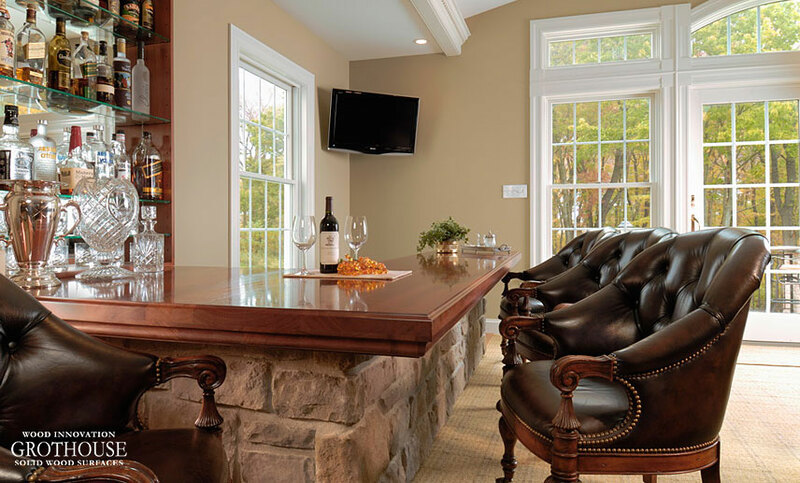 A home bar constitutes a major feature of any room. What truly sets a bar area apart is the countertop in which guests enjoy a drink or two and in which you can prepare drinks and hors d’oeuvres. 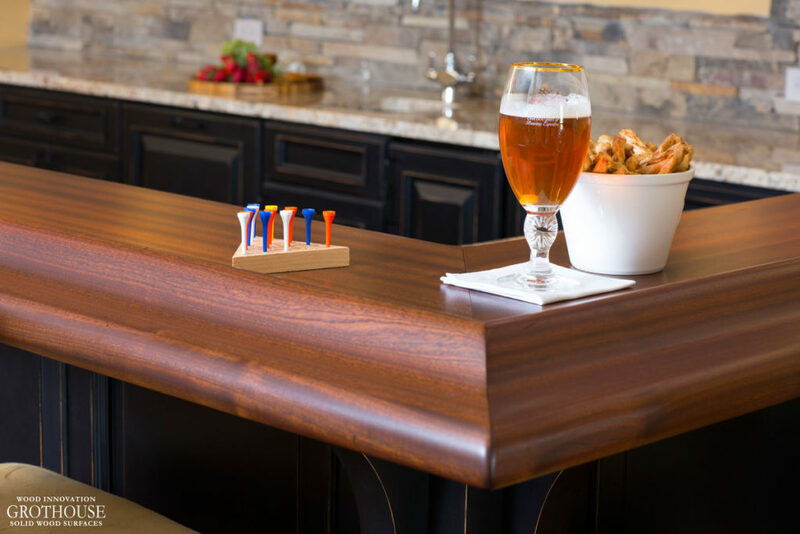 Here are a few unique and innovative designs to inspire custom crafted wood bar top ideas that will make your home bar area and entertainment space stand out. 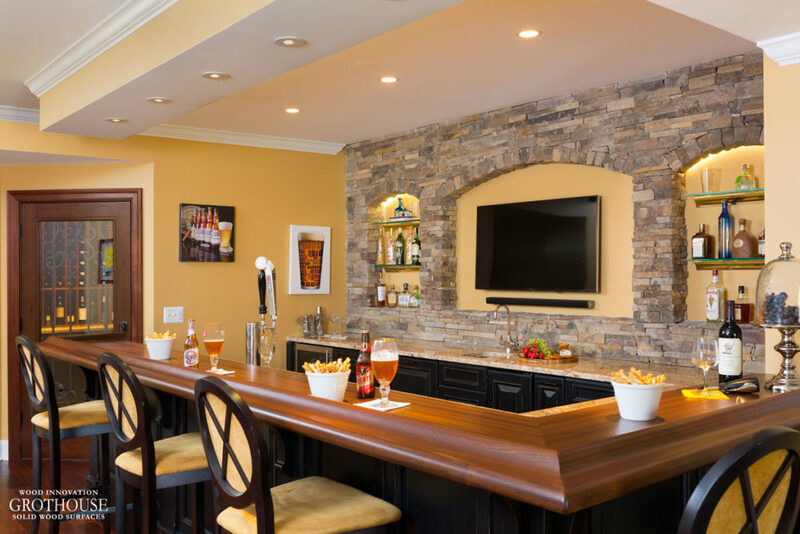 Stuart Kitchens designed this home bar area featuring a custom wood bar top with Synthesis™ Chicago Bar Rail. Synthesis™ Bar Rail is an integrated Chicago Bar Rail carved from the solid wood that creates the countertop surface. The result is a singular piece of bar, with a grain matched surface that eliminates seams at the molding. This innovation also eliminates the need for unsightly mounting fasteners underneath the bar. Glyn Tindall Construction Co. designed this custom Brazilian Cherry wood bar top for an entertainment space in a basement. The distinctive appearance of the bar top is due to the unique idea of using an upside down Medium Roman Ogee edge profile on the bottom edges. Wood-Mode Inc. designed this wet bar to feature a Sapele Mahogany top with Super Distressing. The distressing creates a charming, inimitable appeal. 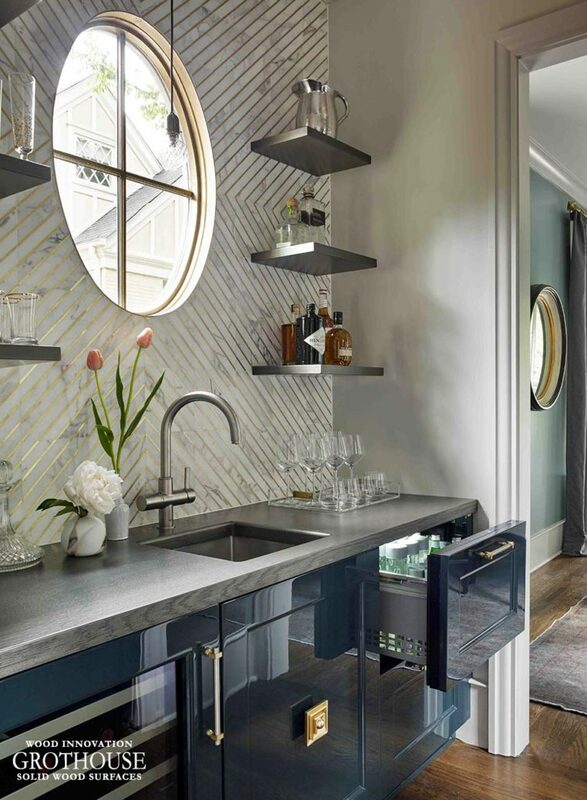 For House Beautiful Kitchen of the Year 2016, Matthew Quinn designed a custom White Oak bar top to be gilded in Anvil™ Argentum Metal Finish. The finish was applied in such a way that shows the White Oak wood grain. Want more bar top ideas? 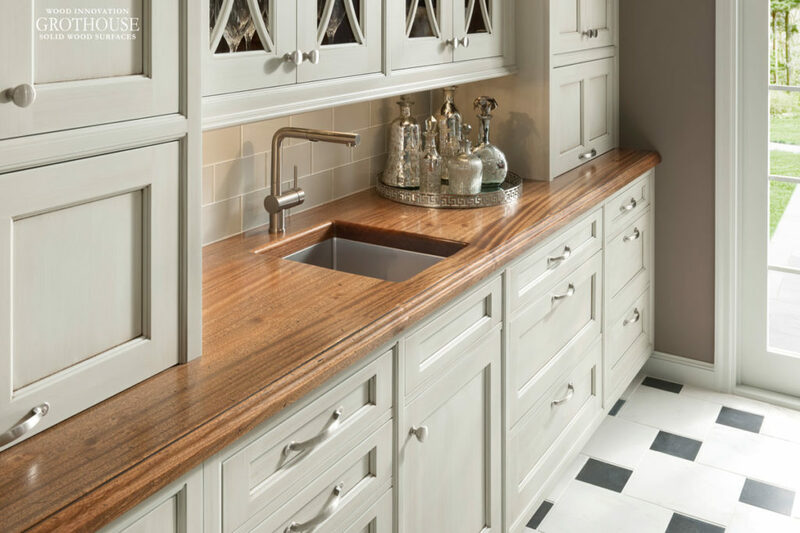 Be sure to check out the Solid Wood Bar Tops section of the Grothouse Photo Gallery. Like us on Facebook for weekly design inspirations. This entry was posted in Anvil Countertops, Bar Tops, wood bar tops and tagged bar top ideas, bar tops, Countertop Ideas, custom wood bar tops, wood bar top ideas, wood bar tops by Denise Grothouse. Bookmark the permalink.